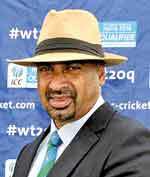 National Cricket Selection Committee Chairman Graeme Labrooy says he will step down from the post of Sri Lankan Cricket Players Association where he wears the hat as its President. There were huge uproars from a section of past cricketers against Labrooy performing the job of National Cricket Selector while performing the duties of the President of the Sri Lankan Cricket Players Association. The past cricketers termed it as a direct conflict of interest. At present, the former national fast bowler wears three hats, to be exact. Besides the two already mentioned, Labrooy also performs duties as an ICC match referee. When inquired, Labrooy said: “So far the cricket authorities in Sri Lanka have not made any moves against me performing these jobs. I am aware even ICC match referee Chris Broad from England acted as the President of the English Players Association for a while. “I have been a member of the Players Association from its inception. Then when the now secretary of the Players Association, Ken de Alwis, asked me a few years ago to take over as its president I refused. Then I agreed to act only as its name sake president and in reality it is secretary de Alwis who performs as its live wire and keeps the association going. When asked about the multiple roles, the conflict of interests and whether the SLC would recognise the Players Association officially, SLC CEO Ashley de Silva said “My personal view is that there is no conflict of interests and I do not see any discrepancy in the situation. However, though we don’t recognise the Players Association officially, there are instances that we work together on certain issues. So much so, during the last Dialog Cricket Presentations we invited its secretary Ken de Alwis to be a part of the proceedings.